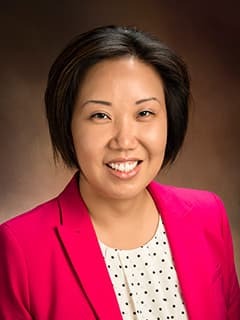 Evelyn K. Shih, MD, PhD, is an attending physician with the Pediatric Stroke Program at Children's Hospital of Philadelphia. Shih EK, Robinson MB. Role of Astrocytic Mitochondria in Limiting Ischemic Brain Injury? Physiology (Bethesda). 2018 Mar 1;33(2):99-112. doi: 10.1152/physiol.00038.2017. Shih EK, Sekerková G, Ohtsuki F, Aldinger KA, Chizhikov VV, Hansel C, Mugnaini E, Millen KJ. (2015) The spontaneous ataxic mouse mutant Tippy is characterized by a novel Purkinje cell morphogenesis and degeneration phenotype. Cerebellum 14(3):292-307. Shih EK*, Natarajan S, Falkensammer C, Beslow LA, Messé SR, Ichord RN. Role of patent foramen ovale (PFO) in first and recurrent childhood cryptogenic arterial ischemic stroke (AIS). Presentation at the International Stroke Conference 2017, February 21-24, 2017, Houston, TX.